Massage is a technique that has derived from many cultures, recorded in use in China as long ago as 3000BC. There are a number of different sorts including Swedish Massage, Sports Massage, Lymph Drainage Massage, Aromatherapy Massage, Thai Massage, Indian Head Massage and many many more, including specialist Pregnancy, Cancer-Care etc. Massage comprises different types of movement and pressures applied to the skin and underlying tissues to release muscular tension and pain and stimulate the circulatory systems of the body. Not only can it assist with physical issues, it is a true holistic therapy in that it also soothes the mind and lifts the emotions. 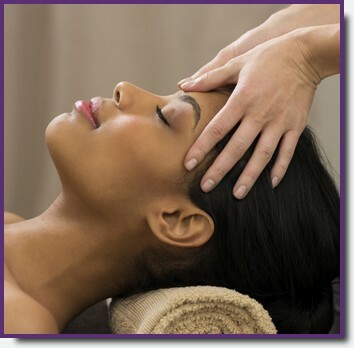 Many people enjoy massage as part of a regular preventative-health regime. Below you'll find a list of all the various types of massage therapy in which I am trained and qualified. The Hydrotherm system of massage allows clients to lay face-up on warm water-filled cushions throughout their entire massage - with no need to roll over half way through, as with other styles of massage. Yet you still receive a wonderful relaxing top to toe massage experience! The Hydrotherm system provides a divine massage experience for everyone, and is especially well suited to anyone who finds it difficult to roll over on the treatment couch during a massage, or uncomfortable laying face down. I would recommend this type of massage for anyone living with chronic fatigue or other painful/uncomfortable conditions. I'm specially trained in Hydrotherm Massage During Pregancy and for people on their Cancer Journey. Swedish/Classical Massage invigorates and benefits all the body's systems and aids the natural healing processes. It aims to relax the whole body through working with the muscles with gliding strokes in the direction of blood returning to the heart. It uses a particular sequence of massage moves that apply varying degrees and types of pressure, including Effleurage, Petrissage, Friction, Vibration, Percussion, bending and stretching. It reduces the effects of stress by relaxing both mind and body. It gives "lift" to the emotions by releasing our natural feel good hormones, endorphines, and increases positive feelings. It relieves muscles by applying pressure to them against deeper muscles and bones. It improves circulation, increasing oxygen levels in the blood. It improves skin and muscle tone, and relieves sore muscles. It can help recovery from muscle strain by releasing toxins from muscles and tissues. It encourages sleep, aids digestive processes, and increases energy levels by reducing body tension and fatigue. Prices start at £25 through to £40. For home visits, please ask for a quote as a small extra charge for travel/set-up&take-down time will apply. This seated massage has been practised in India for centuries and focuses on the energy centres of the head, neck, face and scalp by using key acupressure points. An Indian Head Massage can be carried out as a separate treatment in its own right, and can even be done over clothing without the use of massage oils if preferred. Although it does vary from therapist to therapist, treatment includes not only the face and head but also the neck, upper back and shoulders, and I also include arms and hands, making the whole treatment last a full hour. Price is £35 for a traditional seated 60 min appointment, and £40 if you wish to experience this massage whilst reclined on the warm water filled cushions of the Hydrotherm massage system ... the choice is yours! Call me for a chat if you're not sure which one would suit you best. For home visits, please ask for a quote as a small extra charge for travel/set-up&take-down time will apply. A safe and 100% natural alternative to surgical facelifts, this wonderful facial rejuvenation massage combines a number of massage reliably tried and tested techniques to achieve a noticeably fresher and more vibrant appearance of the skin, every time! Help relieve sinus issues and seasonal allergies such as hayfever, etc. Note that this wonderfully relaxing facial massage and can be carried out using the Hydrotherm massage system, so you'll by lying back on a warm water-filled cushion throughout the whole treatment, making it hard to beat in terms of a relaxing and highly beneficial treatment!! Price is £32 for the facial including neck and shoulders. For home visits, please ask for a quote as a small extra charge for travel/set-up&take-down time will apply. Whilst Cancer Touch Therapy is - strictly speaking - not a massage, it is the closest thing to it that is a completely safe and wonderfully relaxing spa-style body and/or facial treatment for anyone living with, undergoing treatment for and recovering from cancer. The aim is to provide a safe and effective treatment that is 100% tailored and adapted to safeguard the client's wellbeing and provide a completely comfortable and enjoyable experience. Not only do cancer patients need massage and touch therapy, so do elderly or pregnant clients, people on anti-inflammatory medication or those who bruise easily. There are 3 flagship treatments that include the use of 100% organic Made For Life Foundation preparations. Prices start from £24. Additional mileage charge may apply for home visits. Contact Eileen to book a free consultation before your first treatment. Use the contact page of this website to get in touch and I will get back to you as soon as possible. Please let me know your home post-code when you get in touch, especially if you have difficulty travelling and are interested in a home visit. Cancer Touch Therapy was developed by the Made for Life Foundation, Cornwall, and the training is fully accredited by the Complementary Medical Assocation. Please contact Eileen to book a free consultation before your first treatment. Use the contact page of this website to get in touch and I will get back to you as soon as possible. There are a number of conditions for which massage is not suitable. These include D.V.T., serious heart problems, very high blood pressure, infectious diseases etc. For other medicated conditions, massage may be beneficial but the advice of your G.P. would need to be sought before proceeding. These will be covered during your free consultation, to ensure you get the right treatment for your needs but if you are in any doubt, please get in touch to check first.